Wigan have completed the £300,000 signing of goalkeeper Carlo Nash from Championship side Preston North End. 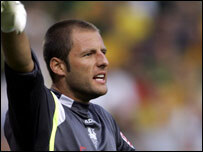 The 33-year-old stopper has agreed personal terms with the Latics after returning from his honeymoon last week. He was transfer-listed by Preston at the end of last season after falling out with boss Paul Simpson for publicly asking for a move to Fulham in January. Instead he spent two months on loan at Wigan, failing to make an appearance during his spell at the JJB Stadium. Nash will do battle with Chris Kirkland and Mike Pollitt to be Chris Hutchings' first-choice keeper next season. Nash's proposed switch to Fulham collapsed in the January transfer window. He voiced his desire to move to Craven Cottage and did not play for Preston again after 20 January. The former Crystal Palace, Stockport, Wolves, Manchester City and Middlesbrough keeper then spent two months on loan as Wigan kept their place in the Premier League.